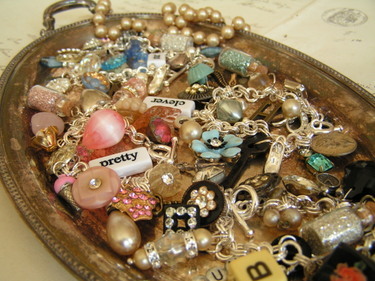 I have been busy making Found Object Charm Bracelets. There are 4 new ones in the shop now, and they are getting harder and harder to part with. I love their uniqueness, the fact that no one else will have one exactly the same. I love that they are made from random bits. Random is interesting. They're loaded with old buttons, vintage jewelry pieces, charms, glitter-filled bottles and so much more. Twinkling treasures on a Sterling Silver charm bracelet! 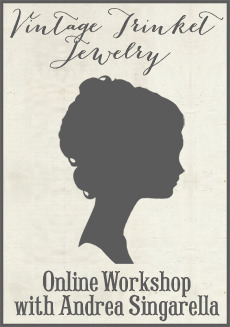 I have long been a collector of vintage jewelry and prefer it to newer jewelry. I think I really started appreciating it's uniqueness in junior high, and I have been wearing old pieces ever since. 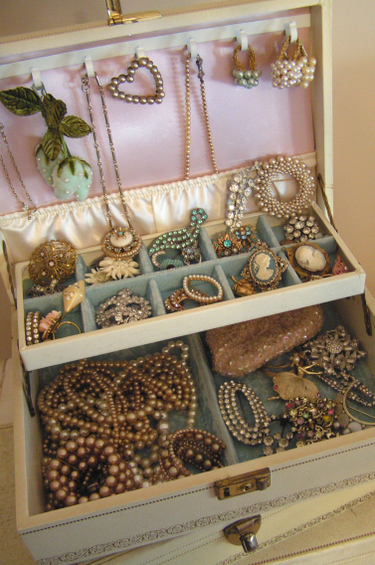 Here are some of the jewelry boxes stacked on my dresser full of vintage baubles that I enjoy digging through. You never know what you may find inside! So, for the love of old jewelry, I have (finally) added the Bundles of Baubles I've been talking about for ages, to the shop. This was an idea I had before the shop opened and it's finally coming to fruition. I've put together sets, or "Bundles", of old pieces that can either be worn or used to embellish your artistic creations with a vintage flair. This batch of Bundles contains lots of old beaded and pearly earrings that are perfect for art. It also includes several rhinestone brooches and other sweet vintage pieces. Bundles of Baubles will be an on-going category, as I am always hunting and gathering old jewelry. You can see the sparkling goods in all their vintage glory here. 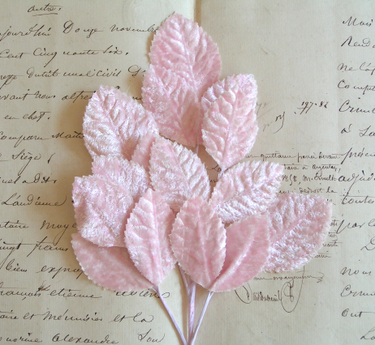 In other shop news, pale pink velvet leaves have been added to the assortment here. This is a soft, beautiful pink color. Also, the popular crown Dresdens are now available in gold too. I know I've been promising new Paper Cakes and Trinket Cones. They are coming, honest, they are. I wanted to have several to present to you instead of listing just one or two. By next week, they should all be complete. I did just add some pretty new Bon Bon Cups to choose from though. Love your new bracelets! I was lucky enough to get one of your other ones & it's beautiful. Love the new stuff in your shop. Have a great day! Your bracelets are beautiful Andrea. I have the teeniest wrists, so if I ever get one I will have to have you make it very small for me. You have been a busy girl. Can't wait to take a look at the new items. You should get that bag for sure!! Yay! I got some of your beautiful baubles! Can't wait to create new and wonderful pieces with them. I too love vintage jewelry. I can't find it as frequently as I would like though I am going to the flea market this weekend so my fingers are crossed! You're right, random is interesting. Love your shop! and hope all goes well with baby! Ooohhh I'm drooling overhere... (way overhere in The Netherlands). Love the bracelet with my first initial! If I only had some money *sigh* untill then drooling is all I have. All of those glittery jewels look good enough to eat! Just beautiful :) P.S. I think that the diaper bag is a must have!! Love all your pieces! So pretty. you have the most exquisite taste. Every time i come to your site i am breathless with excitment and happiness.ironically i just last night watched pratical magic with my little girls ((10 and 12) and i feel compelled to share my love of it with you as well! !The girls are fast becoming fans of the movie as i am.i have some of the songs from the soundtrack to the movie and "coconut" and "case of you" are my favourite songs. The movie is ranked up there as one of my top favourites with notebook and pearl harbour. please keep sharing your beautiful things, i imagine you will be busy in the days before and after the birth of your new son so i am getting my fix of your site whilst i can !! thank-you !! ENVY!!! I know it's not right but that's how I feel about your fabulous jewelry collection. Thanks for everything Andrea. And I love the bundles of baubles. I really do! I love all your jewels! Your one of a kind treasures are just that, treasures. I see that they have sold out already! They are special, and yours alone. I will go to the shop and visit all your new goodies. ps. I think you DO need that bag.really. Andrea - - your Found Object bracelets are absolutely gorgeous - you are so talented, and truly gifted. nothing beats the patina that only time can afford. love your pictures! I am addicted to your blog!! Beautiful! The bracelets are perfect, they sure go fast! Another site tryed to copy your bracelets, but its not even close. You are the best! Thanks! You are an incredibly gifted woman. How inspiring you are! Love your style. Love your new bracelets! I LOVE the "pretty" one...but it is gone :( I love the way you put those cute little glitter bottles on them..adorable. It's all so lovely - complete and total eye candy. I love vintage jewelry as well and have quite a bit of it. Yours looks very organized. Mine...not so much. And I totally think you deserve what ever diaper bag you want - and I agree, you deserve it.